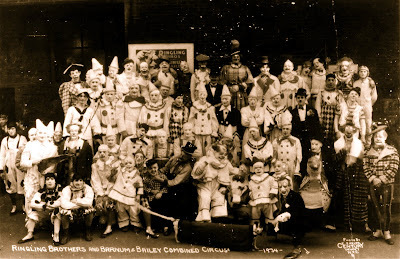 Felix Adler, Lou Jacobs, Charlie Bell, Chesty Mortimer, Paul Wenzel, Jack LeClair, Gijon Polidor, Prince Paul... some of the first half of the 20th century's best Ringling clowns as photographed by one of the era's greatest circus photographers, E.J. Kelty. 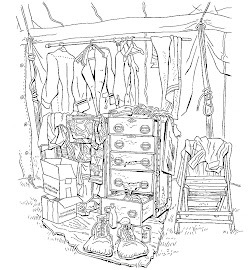 For more info on Mr. Kelty's photographs and an excellent DVD on his life and work please click on the title of this post. Academy Award, Emmy Award, Golden Globe and Tony Award winner Henry Fonda in the General Electric Theater television adaption of Emmett Kelly's autobiography, CLOWN which premiered March 27, 1955. Look for fellow Academy Award winner Dorothy Malone as Emmett's first wife, Eva and longtime actor, Spike Jones sideman and future Little People of America founder Billy Barty as a member of Clown Alley. I sure wish I could come up with a lifetime's worth of great material off-the cuff and in under a half an hour! Every artist dreams of painting their masterpiece. This is Emmett's. Not the funniest gag in the circus world, but inarguably the best known and the one that resonated the strongest with 20th century American circus audiences. This gag was bigger than big, huger than huge and elevated Emmett into a whole different level of celebrity, one that tracended mere "circus star" (such as Clyde Beatty, Gunther Gebel-Williams or the Flying Wallendas) and made him a bona-fide household name. Credit goes out not only to Emmett for creating and performing the gag but also to John Ringling North and his production team for knowing how to showcase it so well. This clip is from the 1967 film THE CLOWN AND THE KIDS, made at the tail end of Emmett's circus career, so it may not be performed here precisely as audiences might have seen it in the late 40s or early 50s but it does provide us a valuable document of this important gag. Video of Emmett performing his Feather Balancing Gag on an early (unidentified) television show. 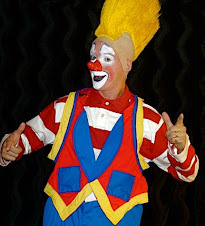 A friend recently took me to task for ignoring Emmett Kelly on this blog. It's true. In over 700 posts I don't think Emmett appears here more than 4 or 5 times. I think it's because Emmett doesn't need me, or anyone, to shine the spolight on him. He's a star. 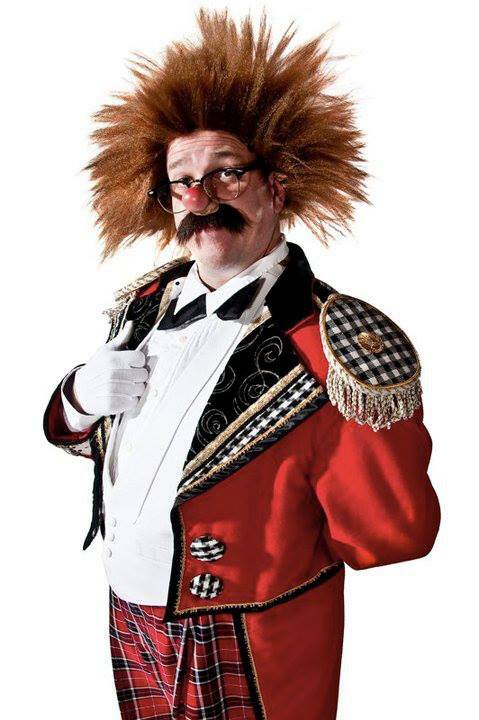 Emmett is still one of the best known circus performers in America and his name and likeness continue to resonate with audiences. But that's no excuse for excluding him. 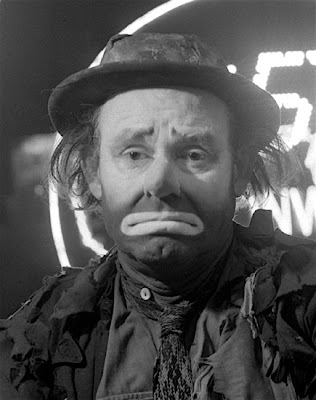 So here he is, the legendary Emmett Kelly as star and narrator of a television special entitled CIRCUS (co-written by future Clown College Director Bill Ballantine) which aired as an episode of THE DUPONT SHOW OF THE WEEK in 1962. Emmett is seen with his trunk, in the Alley of the early 60s Clyde Beatty-Cole Bros. Clown Alley (alongside Kenny Dodd, Lou Nagy and Eddie Dullam seen performing the Washerwoman Gag) and at his home in Sarasota, FL. 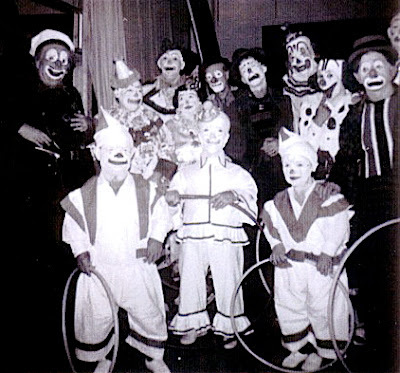 Not sure about the little people down front but the clown cop on the left looks like Charlie Lewis, that's Peluza one and a half guys in on the right (in his Jimmy Stewart GSOE inspired makeup) and that may be George LaSalle in the center with Connie Wilson to his immediate left. The one person that I'd NEVER be able to identify if it weren't for Bill telling me is the person to the immediate right of George LaSalle. That's Dime Wilson is his usual tramp costume but wearing his old whiteface makeup for this one date only. Please click on the title of this post to be taken to Bill's excellent circus blog, YESTERDAY'S TOWNS. The opening scene (according to the film, a nightclub in beautiful downtown Asbury Park, NJ) from Milton Berle's 1949 film ALWAYS LEAVE THEM LAUGHING. 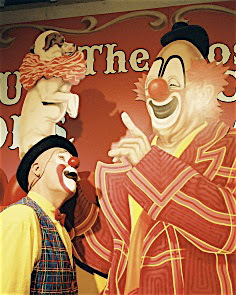 Bob "Doodles" Kelmer, star clown at the Circus World Museum last summer, looks on in loving reverance at the legend that looms large before him.